Call of Duty: WWII (Xbox One) FAST POST. Condition is Like New. Dispatched with Royal Mail 1st Class Large Letter. Activision Call of Duty: WWII for Microsoft Xbox One 2017. Bought new so only 1 owner. Box is in good condition. Has booklet. And the game works perfectly. RELEASE DATE 3RD NOVEMBER 2017. IT WILL BE NEW AND SEALED. Engage in fast-paced action, use an arsenal of weapons and liberate a continent from tyranny in multiplayer mode. Reinforce your preferred style of play by choosing from five classic WWII divisions – each with specific training and skills. Call of Duty: WWII for Xbox One, Boxed with Inserts. Condition Like New. Call Of Duty WWII Features. Choose from a variety of Divisions, including Infantry and Armored Divisions. Call of Duty: WWII (Xbox One) In Great Condition. Experience Call of Duty combat, the bonds of camaraderie and the unforgiving nature of war against a global power throwing the world into tyranny. Product Information. CALL OF DUTY WWII - XBOX ONE. CALL OF DUTY: WWII WW2 - XBOX ONE - NEW & UNSEALED. Experience classic Call of Duty combat, the bonds of camaraderie, and the unforgiving nature of war against a global power throwing the world into tyranny. 5 out of 5 stars - CALL OF DUTY WWII - XBOX ONE. 176 product ratings176 product ratings - CALL OF DUTY WWII - XBOX ONE. Will be sent 2nd Class Signed for. Call Of Duty WW2 Xbox One - Good Condition. Dispatched with Royal Mail 2nd Class Large Letter. No scratches Never even put in xbox. 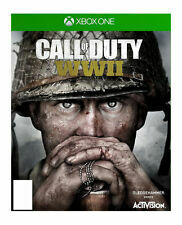 Call of Duty: WWII (Xbox One) (New). More details to be announced on April 26th 2017. For the Microsoft Xbox One Console. CALL OF DUTY WWII. Almost brand new used once and placed straight back in the box, no scratches. Call of Duty: WWII. · CASE: >>>>> Excellent. · DISC : >>>>> Excellent. · OVERALL GRADE: >>>>> Excellent. And now Books. ALL KINDS OF EVERYTHING. If you are happy with our service. All Kinds of Everything. Call of Duty WWII Xbox One World War 2 Condition is new been opened but never been out of its case . Dispatched with Royal Mail 1st Class Large Letter. Call of Duty: WWII for the Xbox One, this is DISC ONLY. I played the game alot myself so I know it plays perfectly. Uk and paypal only please. Check out my other items. Call of Duty® returns to its roots with Call of Duty®: WWII—a breathtaking experience that redefines World War II for a new gaming generation. Land in Normandy on D-Day and battle across Europe through iconic locations in history’s most monumental war. Experience classic Call of Duty combat, the bonds of camaraderie, and the unforgiving nature of war against a global power throwing the world into tyranny. Call of Duty®: WWII creates the definitive World War II next generation experience across three different game modes: Campaign, Multiplayer, and Co-Operative. Featuring stunning visuals, the Campaign transports players to the European theatre as they engage in an all-new Call of Duty® story set in iconic World War II battles. Multiplayer marks a return to original, boots-on-th. Platform Microsoft Xbox One. Region Code Region Free. Location UK. Genre Shooter. Publisher Activision. Call of Duty WWII. Condition is Very Good. Dispatched with Royal Mail 2nd Class Large Letter. Activision Call of Duty: WWII for Microsoft Xbox One 2017. Condition is Like New. Dispatched with Royal Mail 2nd Class Letter. Great game perfect condition no scratches on disc. XBOX ONE CALL OF DUTY WW2.